You heard me right ladies, we all have that staple black bag and those go to black shoes that absolutely go with ‘everything’ in your closet that make running out of the house effortless and easy… I’m calling the kettle black. Though it is as timeless and classic as it is effortless, there is a new neutral in town and it’s bringing on the sparkle! 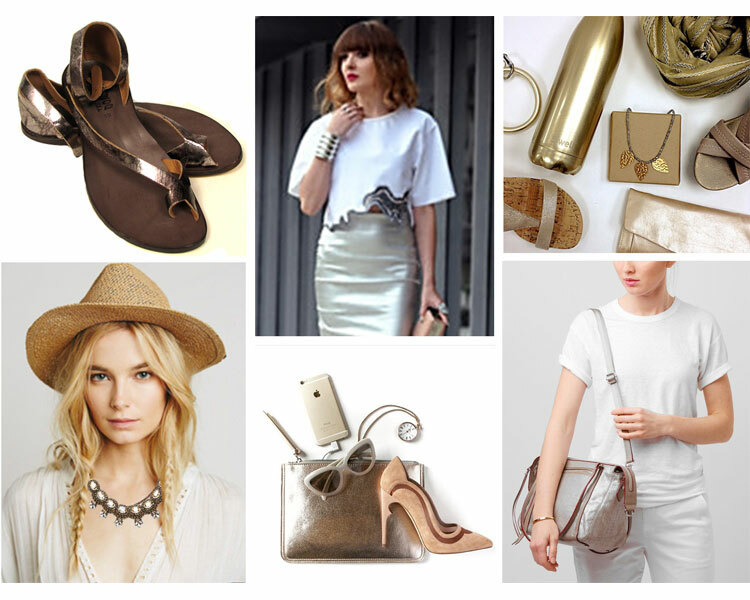 Metallics are here to add a bit more shine into your sunny days! Champagne, antique silver or a soft rose gold is as neutral of a companion as any of your blacks, browns, beiges and greys but with a bigger attitude. A soft silver or gold will compliment any color combination, print or pattern. So swap out that go to black bag for a Remi and Reid champagne reversible tote, maybe an MZ Wallace silver metallic linen threaded cross body bag, a Carla Mancini metallic leather shoulder bag or a Mighty Purse metallic leather clutch! All beautiful metallic accessories in our store and online now! So you’re a shoe girl …try our favorite handmade leather CYDWOQ sandals in the antique silver. The muted metallic tone goes with every maxi dress or summer combination your wardrobe has to offer and are ridiculously comfortable to wear with their hand molded leather arch and leather sole (we all own a pair here and no one will tell you different). The next best thing to walking barefoot… and they will take you wherever you need to go, from outdoor adventure to poolside cocktail party, from New York to LA! If you're looking for a statement necklace to top off a basic look, add your bit of summer sparkle with Deepa Gurnani necklace, layering bracelets or earrings! These fabulous hand beaded pieces in tones of golds dress up any basic black dress or white tee and denim cut offs for an effortless boho look. BEje also offers hoops in everyones favorite new alloy--rose gold. That lovely soft pink hue will warm up any look this summer! We've got the sparkle covered, come discover something new and wear it your way!